Well 3 months down and not much activity! I'm designing a new winter range for my work and the inspiration has finally started to flow now that our busy move is behind us. 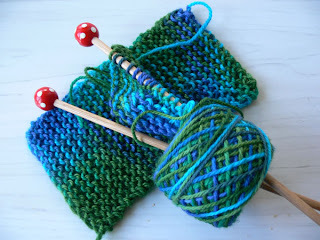 In my spare moments I have begun knitting squares for the fair for the Steiner school that Audrey goes to. Its not very creative - garter stitch is about all I can manage right now - but I'm loving making things with my hands again and the colours are just so lovely to work with I had to post!